Chef Dan brings over a decade of experience as the Executive Chef at The Spa at Norwich Inn to this role. 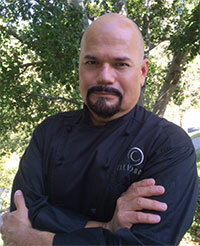 As a culinary educator, his style includes showcasing fresh, locally grown foods and healthfully prepared dishes through wine dinners and hands-on food and wine cooking classes. Chef Dan has been the recipient of multiple awards for his cuisine and innovative approach to nourishment, and was included as a creator of one of Connecticut Magazine’s 50 Dishes To Try Before You Die. The Wine Institute of New England (WINE) was honored by Connecticut Magazine as Best of Connecticut for wine education. Place cherries in medium bowl and add Westford Hill Distillers Kirsch. Soak the cherries overnight. Melt chocolate in double boiler over medium-low heat. Drain cherries, lay out on paper towels, and gently pat dry. Spread cherries over wax paper and drizzle generously with the Baker’s Chocolate.